Dock jumping, also known as dock diving, is a sport in which dogs compete in jumping for distance or height from a dock into a body of water. Dock jumping first appeared in 1997 and there are now a number of organizations that run dock jumping competitions. 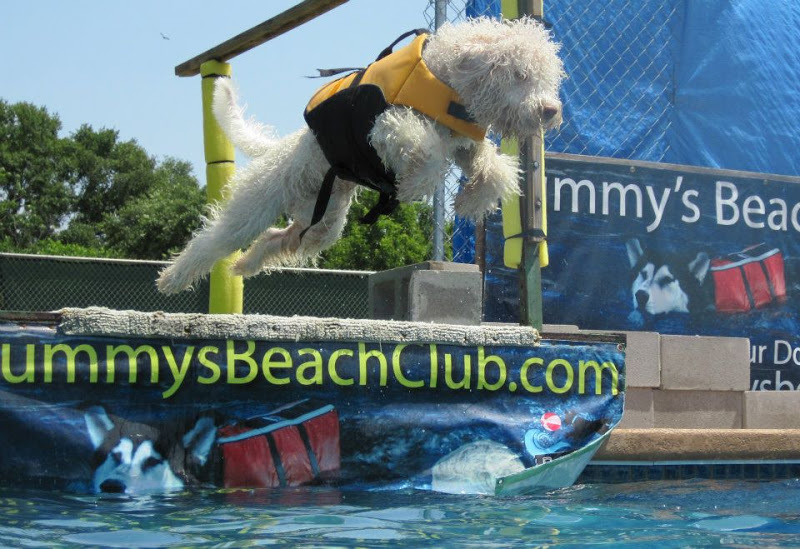 North American Diving Dogs was formed in 2014 and offers diving dog titles recognized by the AKC. Two different jumping techniques can be used to encourage the dog to jump into the water- the Place and Send jump, and the Chase jump. In the Place and Send method, the handler holds the dog while throwing the toy from the end of the dock, then takes the dog back to the start position and sends it to get the toy. In the Chase method, the dog is put on a Stay at the start position while the handler goes to the end of the dock. The dog is called, and the handler throws the toy, timing the throw to keep the toy in front of the dogs nose while they chase it into the water. There are many divisions depending on the sanctioning organization. All teams are ranked according to how far they jump and are rated against teams within their own divisions for placements. Even small dogs have their own division, "lap dogs", along with older dogs (8 years and older), the "veteran" division.